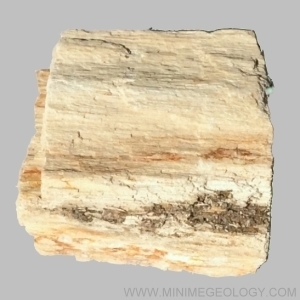 Petrified wood is a fossil that forms when sediment buries and protects plant material from decay. Groundwater rich in dissolved solids such as silica and calcium carbonate flows through the sediment and replaces the original plant material. The mineral-rich water replaces the plant material with quartz (silica), calcite, pyrite or opal among others. The result is a fossil of the original plant material. Because the plant material is replaced, the fossil often preserves details of the bark, wood and cellular structures. An information card with details on the rock formation, mineral content, characteristics, and uses is included. Typical samples sizes are generally 1.0 to 2.0 inches in length or width but can vary based on availability and natural fossil shape.